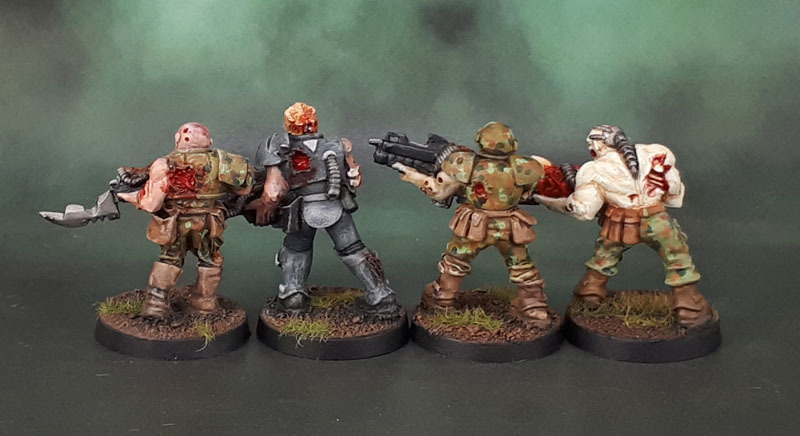 Death Guard | Azazel's Bitz Box. The Twin Powers of my Lost and the Damned Forces. 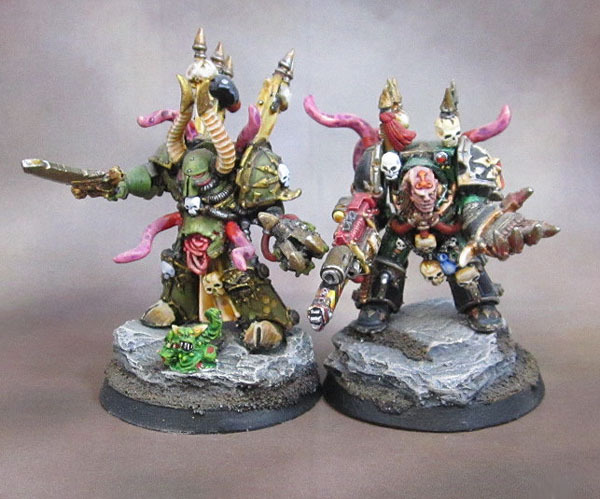 Despite having collected rather a lot of them, I’ve only ever finished a couple of “normal” Plague Marines. These are those few. 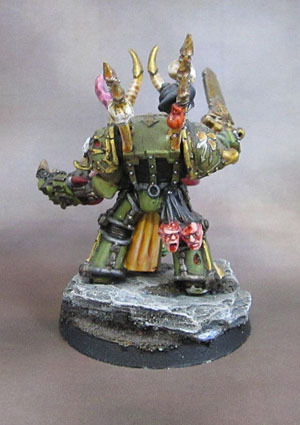 First up we have one of the Two Nurgle Lords in Terminator Armour. Both of these figures were shown in the very early days of this blog about 5 years ago – but as with several other models, new photos and a new context. 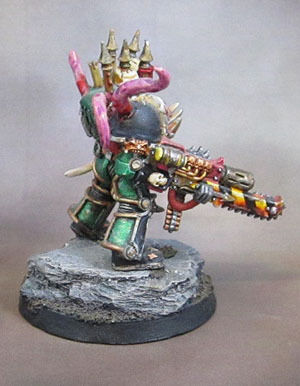 This guy is a Terminator Champion of Nurgle. Converted for me by my mate Dave who had a good supply of figures and was willing to cut them up (I was unwilling to cut up my own metal models after a certain point in time.) Simple enough, it’s a Chaos Terminator base, Jes Goodwin Chaos Champion head, terminator combi-weapon and left shoulder with a Abaddon Lightning claw, with beckoning fingers to finish. I can’t remember if Dave put the tentacles on it or if I added them myself later on. 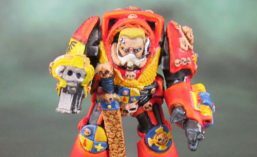 Abaddon’s claw is still a fantastic “bit”. Makes for a great “come, try it” beckoning look. 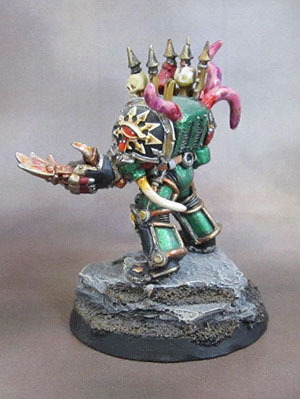 Plague Marine Terminator Lord Conversion. Another Terminator Champion of Nurgle. I think Dave started this guy but I was unsatisfied with the result so extensively reworked it myself. Abaddon body, Chaos Warrior right arm with the original Chaos Terminator Power/Daemon sword on the end of it. I’m pretty sure I swapped out the original left arm for the GorkaMorka-era Ork Bioniks Claw and swapped in the plastic Chaos Champion head. I also drilled out the various tri-abcesses in the armour, added the bloated torso with putty over the top of some plastic Zombie intestines, added the dismembered heads, sculpted the simple hooves and added the tentacles. This guy in his olive-coloured armour has much more of a traditional Death Guard Plague Marine colour scheme of the days when I painted him. 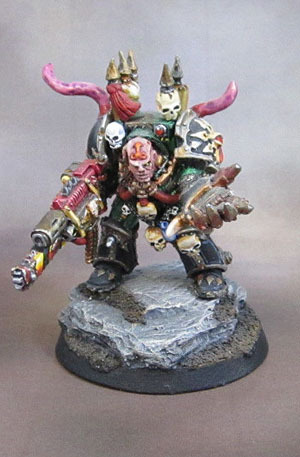 When I get back to my Plague Marines and past the half-finished ones, I need to figure out a scheme to go with for the rest and then try to stick with it. Greens? Browns? Grungy Metallics? 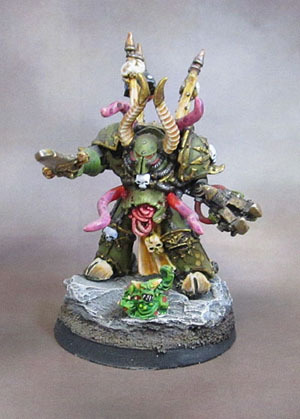 Death Guard White and Green? 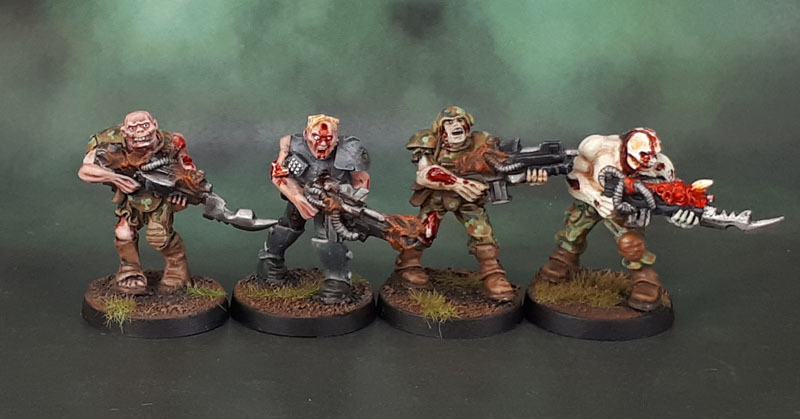 This combat squad of 5 is all I managed to finish. I went copper/black with metal and some hazard stripes. This was years before I decided to build an Iron Warriors force (that I also need to get back to!) but the stripes will integrate the two of them nicely. 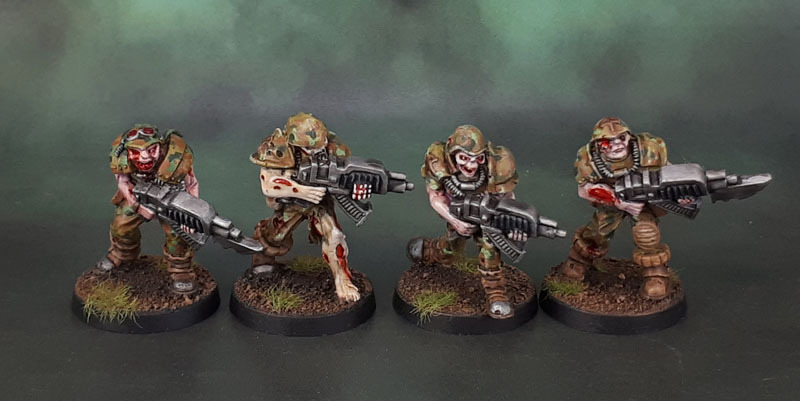 The Plan (which never got finished) was for the second squad of these guys to have a very similar scheme, but with metallic green replacing the copper. 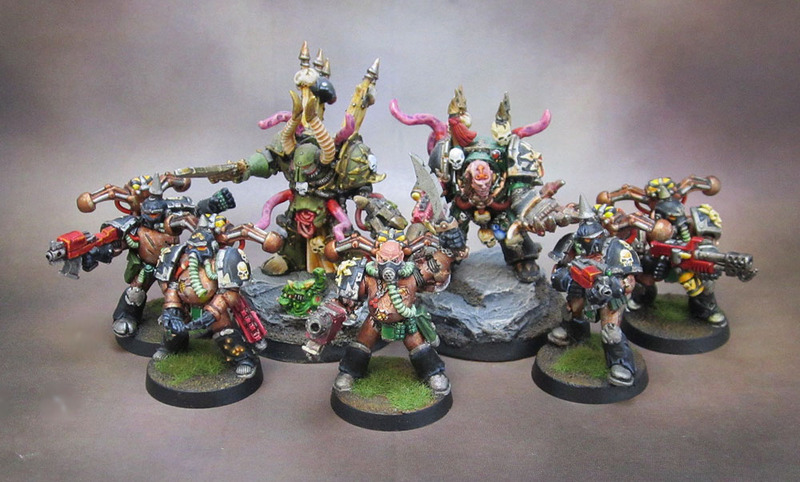 “Interest” shot of the Plague Marines. I didn’t want to go too nuts with pictures, so the group only gets one to show off their “best side” when they have one. GorkaMorka bionic bolter for the Sergeant, and some paint-over-decals for the others. 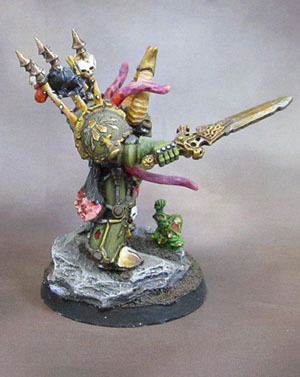 And if you’re wondering just WTF that one Plague Marine is doing – he’s giving his enemies the “crotch chop”. Because I am nothing if not classy. Finally, the group shot. As always – click to embiggen.